A group of seniors a concerned about speeding drivers at a busy downtown intersection, saying it’s making it nearly impossible to cross the street safely. 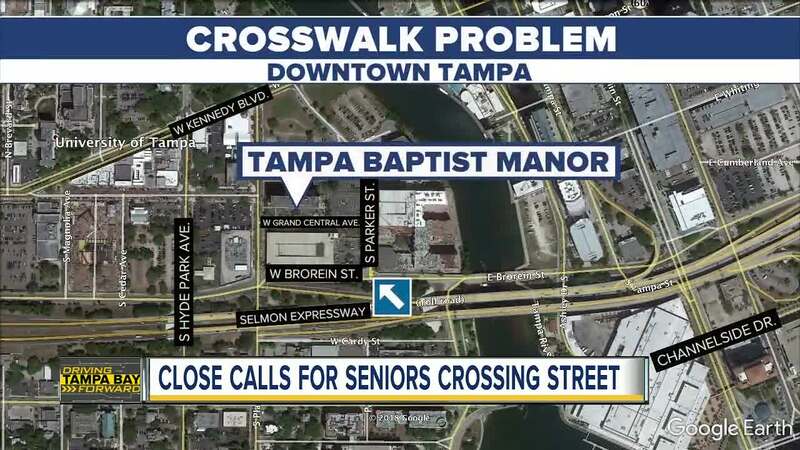 TAMPA, Fla. -- A group of seniors a concerned about speeding drivers at a busy downtown intersection, saying it’s making it nearly impossible to cross the street safely. Steven Anglen moved into the Tampa Baptist Manor more than a year ago and uses a motorized scooter to get around. He said the intersection at Parker and Brorein street has become increasingly dangerous. Anglen said he was nearly hit and killed trying to use the crosswalk. 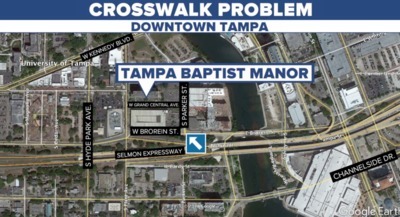 Many of the residents at Tampa Baptist Manor do not own cars and are using scooters and wheelchairs to get from place to place, Anglen said. They often use the crosswalk at Parker and Brorein to get to the nearby Publix. Residents are now even more worried as a brand new apartment complex is being built across the street, bringing even more people to the area. ABC Action News took their concerns to the City of Tampa’s Transportation Department. City leaders tell us they already have plans in place to install a new rapid flashing beacon at Parker and Brorein but they do not have it scheduled just yet. Jean Duncan, director of Transportation and Stormwater Services for the City of Tampa, said she agrees the speeds coming off the bridge at Brorein are high and the city is considering a traffic calming project to help slow drivers down in the future. The presence of a sight obstruction at an intersection or driveway, or an obstructed traffic sign or signal.